After working in my spare time on my second game for about a year I have finally released it! 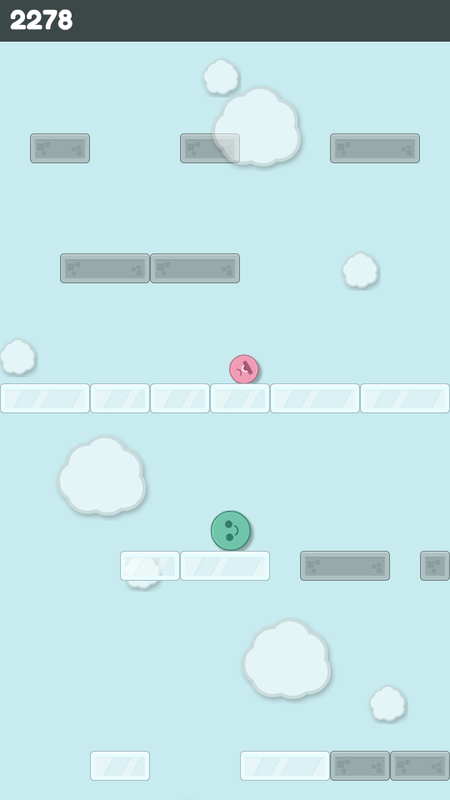 Skyroll is an action game where you need to get as high in the sky as possible. You control a round smiley face by tilting your phone to make it roll into the direction of the gravity and jump by touching the screen. For PC controls you make use of the arrow keys / space or WASD (minus the ‘S’, there is no ducking or moving down). I always liked playing Doodle Jump, so the idea of an endless game where you need to get as high as possible was the starting point of the game idea. I did not want to copy the exact game mechanics, so I decided to instead of the player moving up to make the level move down at a constant speed which speeds up gradually after time. I was looking for graphics for the game and found the Physics Assets set by Kenney.nl. 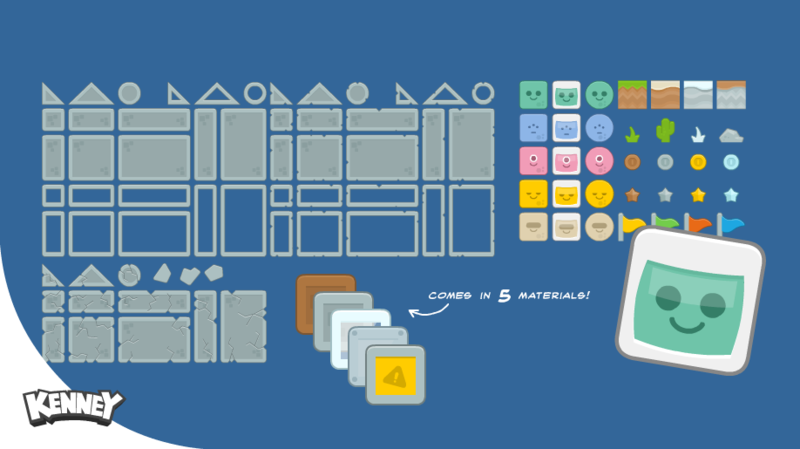 These elements were perfect for my platforms and the smileys (with some minor alterations) for the player and the enemies. The default physics in HaxeFlixel are fine for simple collisions, but I discovered that it is not easy to make circles collide with rectangles etc. I have always been fascinated by the impressive Physics Examples at Napephys.org (check them out if you are not familiar with them), so this was a perfect opportunity to use the Nape library for my game. The BodyType.KINEMATIC makes the body static and not affected by physics, because I am using the player in the start menu as a background and make it jump when the player starts the game. At that point the body type is set to BodyType.DYNAMIC and the Player will be affected by gravity. When the two bodies trigger the CbEvent.BEGIN event the fuction onPlayerStartsCollidingWithEnemy is called and the program can take action (lose a power up or die). This logic is taking from the OneWayPlatforms demo on the Napephys website. Divide the phases in ‘levels’. Rows can consist of 15 blocks to be filled by the Platforms (full width of the screen: one block is 36px and the screen width is 540px (15 * 36)). Rows should be a collection of amounts of Platform types (e.g. 3 Wood and 5 Glass). Platforms are made of 1, 2, or 3 blocks. Every time a Row is drawn, the blocks are randomly placed in the 15 block space. Platforms are to be drawn with as many blocks as possible. So if a Row should consist of 5 Glass blocks, one Platform with 3 blocks and one Platform with 2 blocks with be randomly placed on the Row. The use of levels makes it possible to for example only draw Rows that consist of Glass platforms and in the next level introduce Wood or Stone elements. See the source code of the Level Generator for more information. I wanted to experience with some kind of advertisement in the game. I have no illusions about earning (any) money with this game, but I am curious about the clicking behavior of players and how to implement this kind of library. I tested different libraries and choose the samcodes-admod library by Sam Twidale because it worked very well and is actively maintained (always important when using Open Source Software). Unfortunately it conflicted with the google analytics library (ganalytics) that I was using, so I dropped this and choose Flurry for analytics by using linden-flurry. The plan was to finish this game within a month (again), but I failed to do so (again). The main reasons were using new techniques (Nape), creating everything from scratch (Menu, Popups, etc) and the implementation of the level generation. In the end I am happy to have a finished game. That’s what counts the most for me. See you soon(er hopefully 😉 for game #3!